As a regular on the lists of amazing treks, the Zion Narrows Hike is a 12-hour tour of tight sandstone canyons, rising above you like city skyscrapers, peppered with gardens of desert flowers. From a half-day trek to 1-2 days. Strenuous, with most of the hike in the Virgin River. Imagine walking in a river, thigh-deep in cool water with sandstone canyon walls rising 500 feet above you. The colors of the flowers in the hanging gardens contrasting the aquamarine Virgin River and the reds and oranges of the walls. While the hike can be done in one long day, spend the night in the canyon to have a truly unique experience. Pop a tent in a designated campsite and watch the desert stars come out above, framed by the nighttime canyon. Alternatively, Zion Narrows hiking can be experienced by continuing up the Riverwalk Trail, or by descending the technical Orderville Gulch, both of which are great options depending on the group's ability level. The most sought-after backcountry trip in Zion starts at the Chamberlain Ranch Trailhead and walks the river all the way to the Temple of Sinawava. Most visitors take two days for this trek, staying at one of the designated campsites along the way. Most hikers use the transportation companies to arrange the drop-off. To get to the trailhead by car, drive 2.5 miles past the East Entrance on Route 9, turning left on North Fork County Road. After 18 miles and a bridge over the North Fork, turn left and drive .25 miles to the Chamberlain Ranch. Closing the gate behind you, park by the river, .5 miles ahead. The trailhead is 3 miles up the road. The easiest way to explore the canyon is from the Temple of Sinawava, hiking up the Riverside Walk, then continuing upstream until the group decides to turn around. 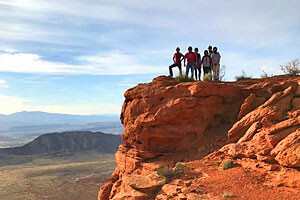 Many visitors try to reach Orderville Gulch, about a two-hour hike each way. The Temple of Sinawava Trailhead is located at the end of the shuttle route, so just hop on the bus for a quick ride to the start of the hike. A popular canyoneering route goes through Orderville Gulch, which is more narrow than the Narrows, reaching 10-foot widths in places. The trail meets with the Zion Narrows two hours upstream of the Temple of Sinawava. 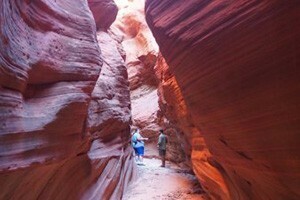 The trail is not particularly technical, but it does require canyoneering experience and equipment. As with the Chamberlain Ranch Trailhead, most hikers use the transportation companies to arrange the drop-off. To get to the Orderville Gulch Trailhead by car, drive 2.5 miles past the East Entrance on Route 9, turning left on North Fork County Road. After 10.7 miles, turn left on a small dirt road and park 100 yards down, by the corral. Hiking the Narrows from the top down requires a backcountry permit. The Chamberlain Ranch Trailhead is a 1.5 hour drive from Zion Canyon, making visitors plan out their transportation. Arrange a ride with one of the shuttle services, or plan on shuttling cars. 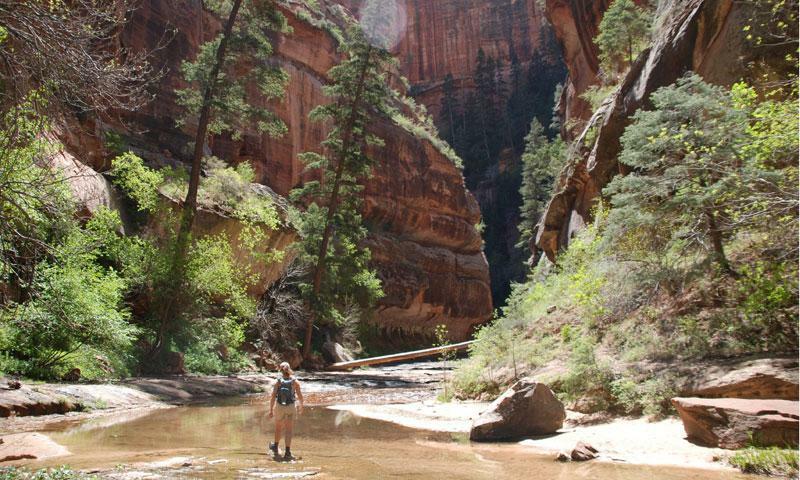 Either hiking Zion Narrows Trail or canyoneering the Orderville Gulch require a backcountry permit, which must be obtained from the park office either as a lottery, or as a walkup. Because of unsure footing and slippery rocks, ski poles or a strong walking stick are an absolute requirement. Dry bags are recommended for anything that needs to stay dry, like a camera or a phone.